The Pendleton and Elisabeth Carey Miller Charitable Foundation and the Elisabeth C. Miller Botanical Garden would like to invite the members of the Hardy Plant Society of Washington to attend the Elisabeth Carey Miller Memorial Lecture. This yearly event is dedicated to the horticultural legacy of Mrs. Miller and highlights her commitment to education and public outreach. This is a free lecture and is offered as a gift from the Charitable Foundation to the horticultural community. 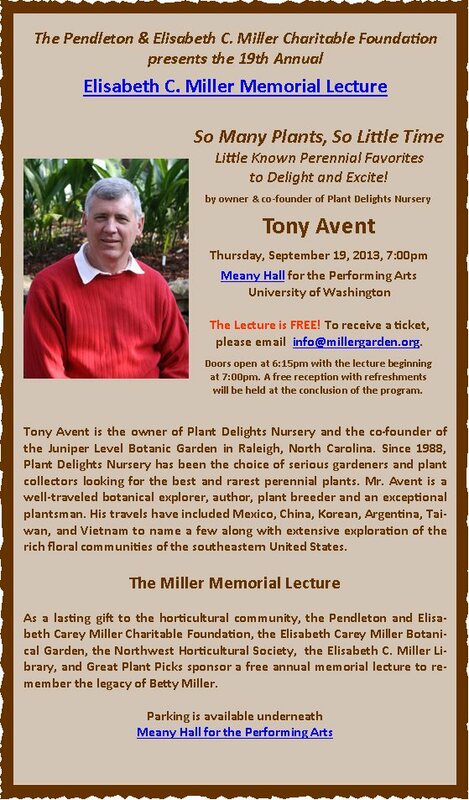 The lecture this year will feature renowned plantsman and horticulturist Tony Avent, owner of Plant Delights Nursery and the co-founder of the Juniper Level Botanic Garden in Raleigh, North Carolina. 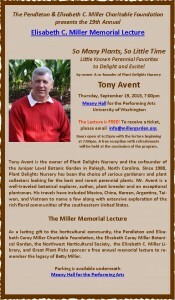 Mr. Avent’s talk will be So Many Plants, So Little Time: Little Known Perennial Favorites to Delight and Excite! Below is an invitation that can be shared with others in your organization. If you have any questions or need the invitation in a different format, please contact me at rickp@millergarden.org or call the garden at the number below. Reservations for free e-tickets can be made at info@millergarden.org or by clicking the links below. I hope that you will be able to join us and I look forward to seeing you there.